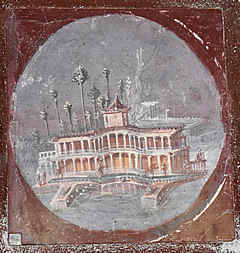 These three magnificent villas, close to Pompeii, show just how privileged the elite members of Roman society were; set close to the sea with magnificent views they were the height of luxury with their many beautifully frescoed rooms, pools and fountains, baths complexes, gymnasia and even a swimming pool! Room numbers refer to maps and leaflets provided at the villas. North front of the villa with a Viridarium - a garden planted with trees. Porticoes of the north front stretch either side of the double height Room 21. 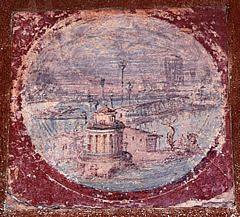 About 5km west of Pompeii ancient Oplontis was a coastal town where today the town of Torre Annunziata is situated. Here stood the luxurious Villa di Poppea, some very rich person's seaside home. 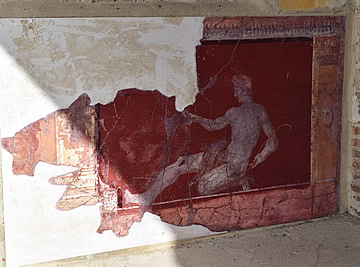 Construction began here some time in the 1st century BC but the villa was remodelled and enlarged several times. 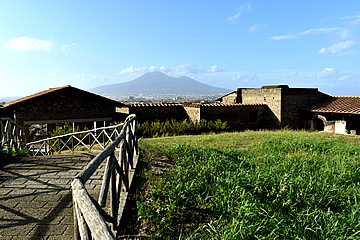 At the time of the eruption of Vesuvius in 79AD it was again undergoing extensive remodelling. 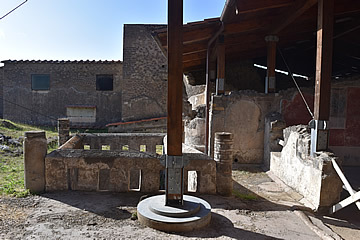 The area of the villa and gardens that we can visit today covers around 10,000 sq m including extensive gardens and a 60m pool, but there is much unexcavated due to modern building. 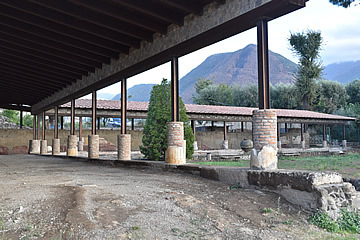 Colonnade along the north front of the villa. 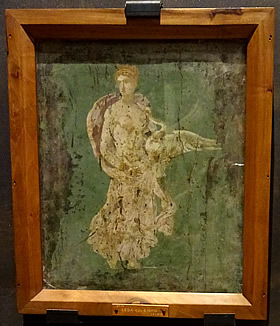 The First Style from the 2nd century BC. 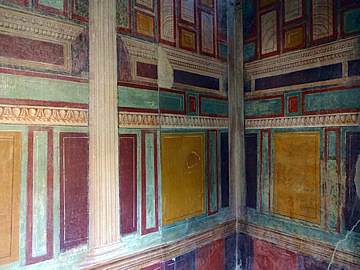 imitated marble in rows of brightly painted panels. At the end of the 2nd century BC, the Second Style developed, typified by architectural elements such as columns framing a view of landscapes or artwork. 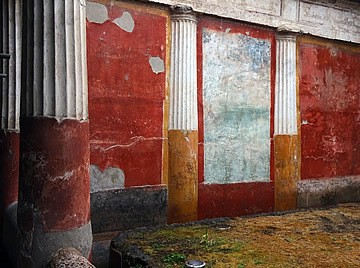 Half columns on one of the walls of the small garden between Room 21 and the atrium. The Third Style, between 20 BC and AD 40-50, divided walls into three zones, upper, middle and lower. The middle zone was composed of large rectangular panels separated by elegant designs of architecture or vegetation. 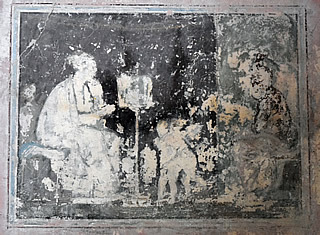 Figures and Egyptian imagery begin to appear. 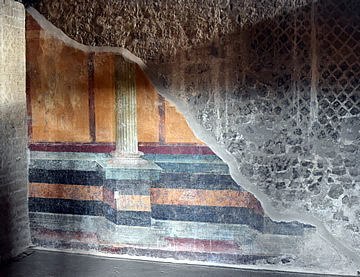 The Fourth Style emerging around 50 AD is much more complex, with two main strands: the first covers the whole wall and includes architecture, wide landscape views and full-length figures; the second develops from the Third Style with pictures centred in panels. On the back wall is a cooking range which would have had fires below in the three alcoves. A flight of steps descends at the side of a Viridarium - a garden area planted with trees - to the north front of the villa which has colonnades flanking an imposing open room (Room 21) of double height with fluted Doric columns. 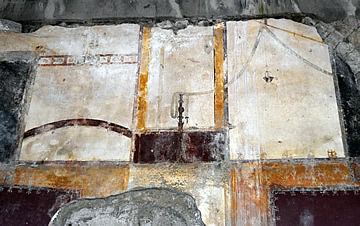 The original entrance to the villa was on the south side and is unexcavated. 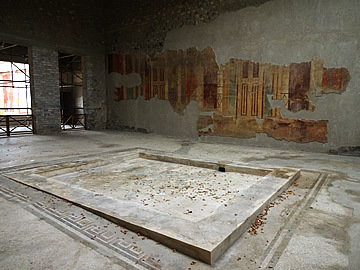 Directly south of Room 21, though with no directly connecting doorway, is a small garden and a large atrium - a courtyard with a pool. 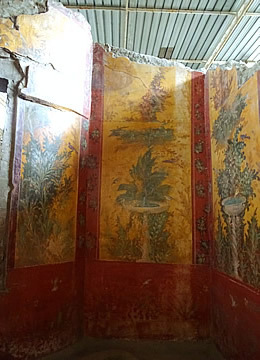 There was a large square hole on the south wall of Room 21 looking directly through to the garden and atrium beyond, both with walls decorated with colourful frescoes. West of Room 21 is a kitchen and a small baths complex centred on a tetrastyle (i.e. with four columns) fountain. 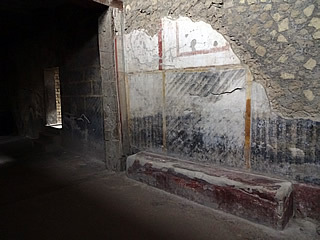 The suite of rooms included a calidarium and tepidarium, though no frigidarium is shown on the map provided with the entrance ticket. 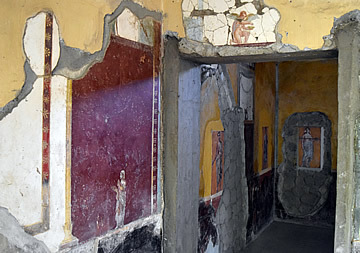 These rooms were added during an expansion phase around 10 AD and remodelled into entertainment rooms after 45BC in the Fourth Style. 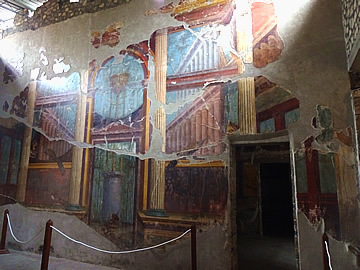 The atrium and nearby rooms are the oldest part of the villa.1 Here some beautiful Second Style frescoes have survived, as in the main living room or oecus - situated on the western perimeter of the house it would have had fine views. 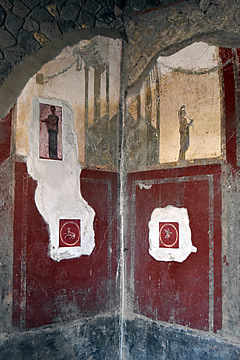 Wooden doors in the south entrance to the main living room were preserved in the pyroclastic flow from the eruption of Vesuvius. 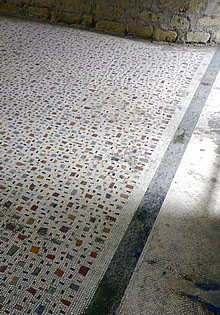 White mosaic floor with coloured marble inlay. 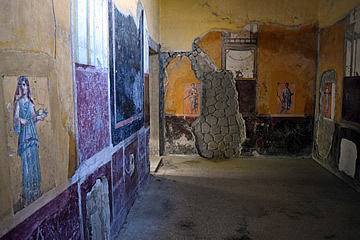 As at Herculaneum, the villa was engulfed in a pyroclastic flow of superheated volcanic mud which smothered everything in its path. So there was not much burning here and, though wooden items were charred, they survive remarkably intact. 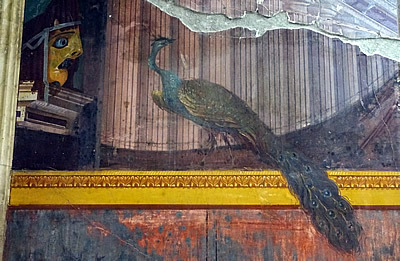 Detail from the Second Style frescoes - theatrical mask and peacock. 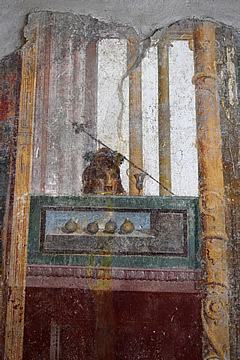 Classic Second Style with paintings of columns framing a view. 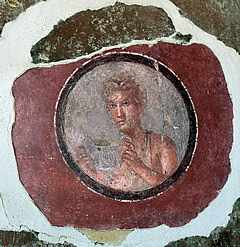 Similarly there are wonderfully preserved Second Style frescoes in a triclinium next to the living room. This is a dining room where diners would have reclined on couches on three sides of a low table. 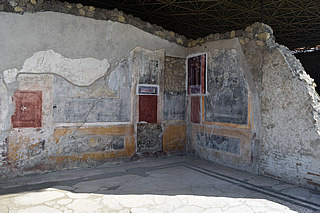 There is a cubiculum (a bedroom, though used also for other purposes) on the south west corner of the atrium (although there is no direct doorway to it from the atrium) and another finely decorated room is opposite on the south east corner (again with no door into it from the atrium), also one of the oldest rooms in the villa. 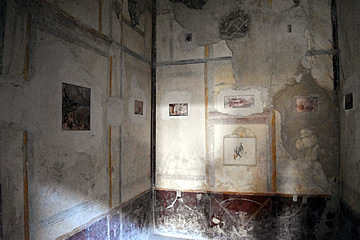 This room, designated Room 23, has Second Style frescoes with theatrical masks, virtually complete with relatively minimal damage. 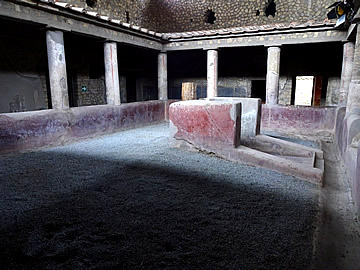 East of this room and of the atrium is a peristyle which formed the centre of the slave activity,3 with sleeping quarters on two levels and the villa's latrines in the north east corner. 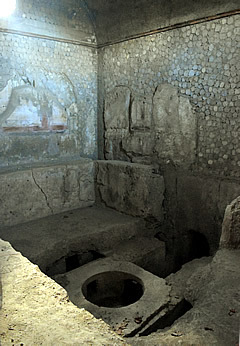 On its west side was a lararium where there would have been a shrine to the household gods. Peristyle east of the atrium. In the central garden is a fountain. 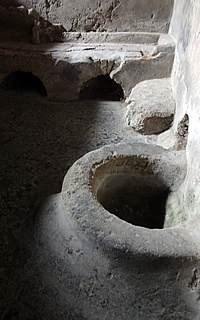 The communal latrines were flushed with running water from the tank on the right. 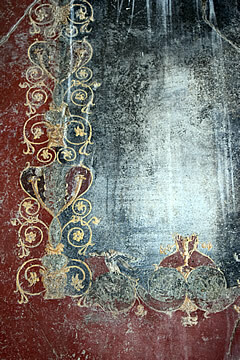 Fourth Style decoration in the long corridor. This is the west end, the doorway leads to the latrines. 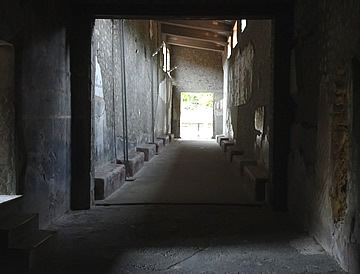 The long corridor leading from the peristyle to the east wing of the villa. 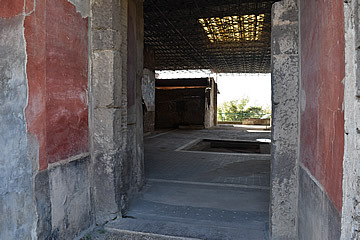 It seems very strange to me that servants occupy the central portion of the villa, alongside the latrines, separating the two luxurious east and west wings. To get from one side to the other, especially in bad weather, would necessitate walking through this servant area. 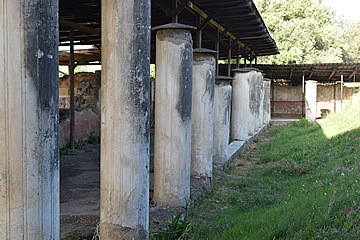 Peristyle connecting the east and west wings of the villa. The clerestory windows allow light into the long corridor. There was an alternative outdoor route through a corridor and peristyle, leading from the atrium at its west end, to the south end of the east wing and the 60m long swimming pool. The 60m swimming pool - it would be nice to see it filled with water. 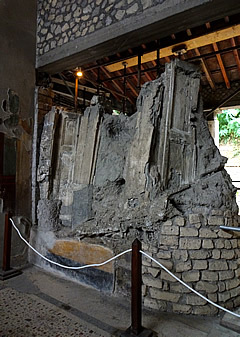 Columns from the swimming pool were discovered stacked in Room 21, probably as part of the remodelling of the villa after the earthquake of 62AD. Along the west side of the swimming pool are entertainment rooms separated by garden rooms, open to the sky, and guest accommodation (ospitalia). Rooms at the south end of the east wing form a small group set around a larger room with windows overlooking the pool and gardens. Steps led down into the pool from its south end so there may well have been a changing room here. Garden rooms separated three entertaining rooms on the villa's east, decorated in horticultural themes with fountains and birds. The central entertaining room was at least twice the size of the other two. Villa Arianna stand on a cliff giving it amazing views - north to Vesuvius and west across the Bay of Naples. 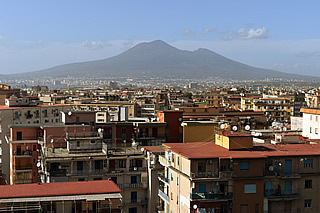 Where the northern coast of the Sorrento peninsula turns north towards Pompeii stood the ancient town of Stabiae, today Castellammare di Stabia. 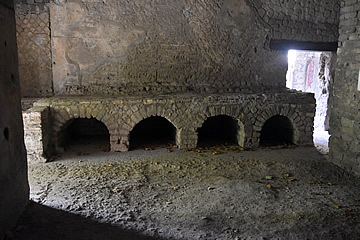 It is a favoured, sheltered location and the richest of the Romans built luxurious villas here, ranged along a broad terraced cliff of the Varano Hill with wide views over the Bay of Naples and the mountains inland. Ramp leading to a tunnel under the residential wing and down to the sea. The open structure with low punctured walls allows light into the tunnel below. The land in front of Villa Arianna was terraced down the hillside on two or three levels. 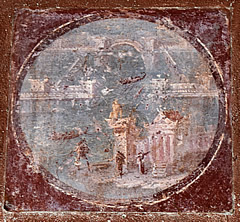 The sea could be reached via a ramp and tunnel under the villa - the sea would have been much closer 2000 years ago. 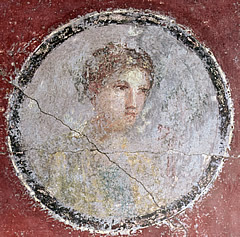 Mosaics such as this were often placed on the threshold of a room. 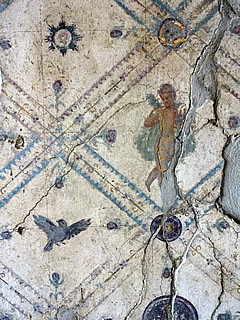 This large villa, originally built in the 2nd century BC and therefore one of the oldest in the region, obviously belonged to a very rich family. 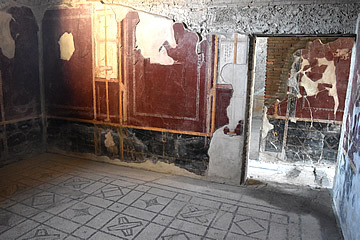 It has numerous rooms, many bedrooms, day rooms and dining rooms, its own baths complex including frigidarium, tepidarium and calidarium and sauna, an enormous outdoor palestra - an area for exercise and sports such as wrestling - and beautiful frescoes and mosaic floors. Eastern edge of the palestra which was surrounded by a portico. The villa, including gardens and terraces, occupied an area of easily 7,000 sq m but the palestra on its west side must add another 3000 sq m! The palestra was one of the last additions to the site, probably post-69 AD. Flying figures wall decoration in a day room (Room 12). The summer dining room on the west end of the residential wing opened north onto the hillside with three large windows on each of its east and west sides and three smaller windows on its south side. On its east and west sides were veridaria - enclosed gardens planted with shade trees. Windows did not have glass panes, some would have had wooden shutters. 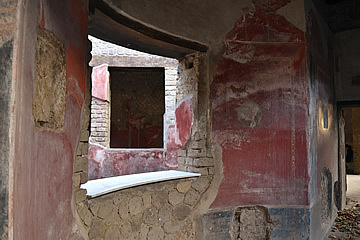 The large windows in the triclinium were designed to provide views of the trees and the Bay and to allow in cooling breezes. 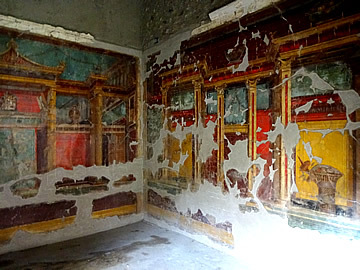 With such a large number of windows there was little wall space left for frescoes. 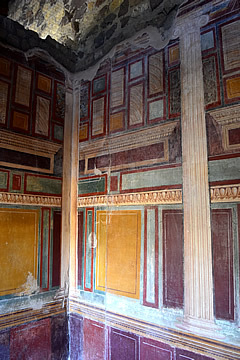 Room 12, a day room, is the first room east of the summertime triclinium. 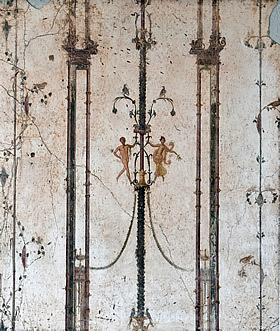 It is most delicately decorated with flying figures on slender chandeliers. 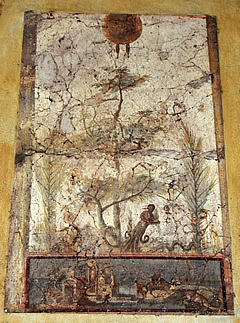 Wall decoration Room 9: figures and birds. Still a fine view today, 2000 years ago, without all the buildings, it must have been spectacular. 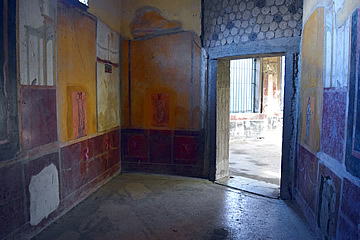 Along the front of the villa facing the Bay of Naples were many day rooms. 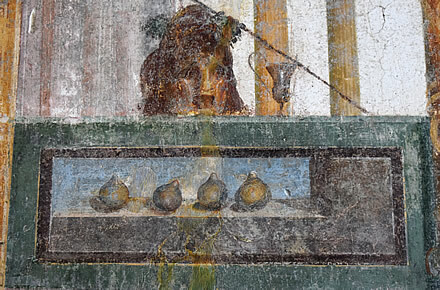 As well as the large triclinio estivo - the summer dining room - there was a second large dining room on this side. 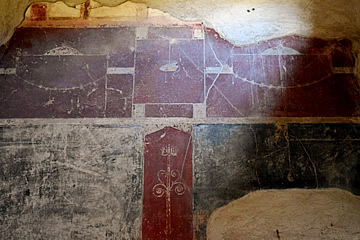 Rooms here would have had panoramic views and were intricately and colourfully decorated. Day room 7 has some exquisite portrait painting - perhaps they depict family members, or maybe just deities, or mythical characters. Yellow decoration on the walls of Room 10, a bedroom. 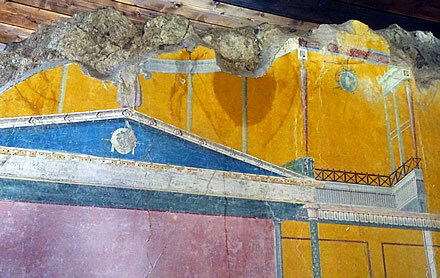 As in many Roman rooms red followed by black are the dominant colours, but at Villa Arianna we see several other colours used, including quite a bit of yellow, and bright blue and pink. 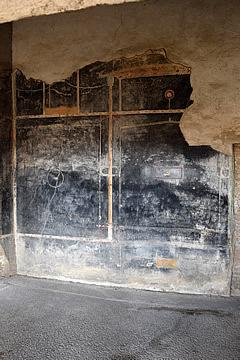 A corridor separates two day rooms (7 and 9) at the front of the villa overlooking the Bay of Naples, and behind each is a cubiculum, Rooms 5 and 10. 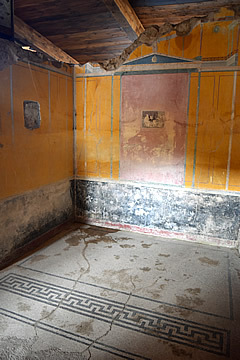 This bedroom (cubiculo, Room 5) was separated by a corridor from a second bedroom (Room 10). This would have been an impressive environment to receive visitors - providing for their every comfort and entertainment was an important function of these luxurious villas. Whether visitors were present or not, however, there were many activities available: hunting, fishing, walking in the gardens or in shady porticos with fine art on the walls, swimming and exercising before bathing prior to dinner.7 Dinner was one of the most important events of the day and could last for many hours. 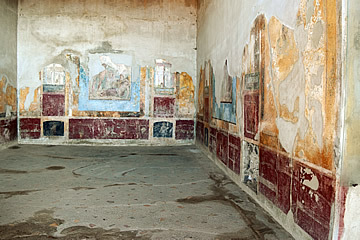 East of Rooms 5,7,9 and 10 is a large triclinium (dining room 3) on the back wall of which is a square fresco of Dionysus arriving on Naxos where he sees Ariadne. 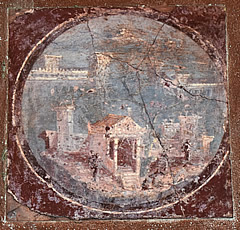 It is from this fresco that the villa takes its name. 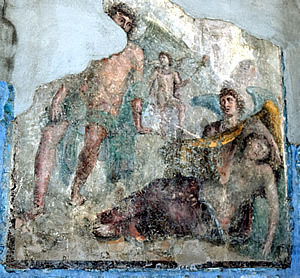 A square fresco of a mythological subject is at the centre of each of the three walls. Courtyard - this is probably a fish tank. 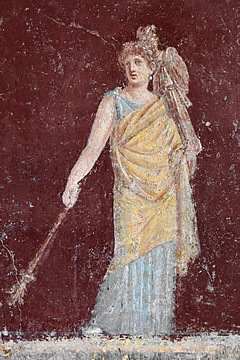 Fabulous use of colour and a beautiful mosaic floor; in the centre of the pink panel is the painting "Venus, seller of cupids" - see below. 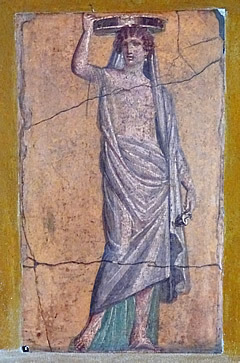 Dyonisus would have been a popular choice for a dining room fresco, along with any subject to do with food or drink. 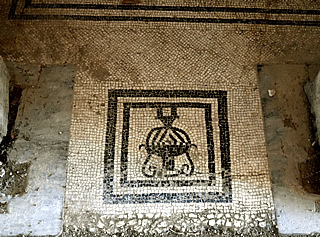 Mosaic at the threshold of Room 89. 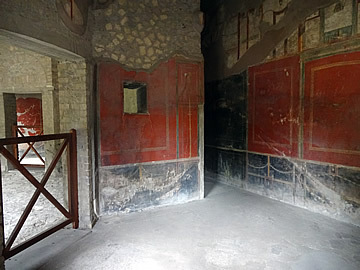 East of the triclinium, more day rooms (1 and 2) then into a service quarter with a large kitchen behind Rooms 1 and 2, entered from Room 21 which is actually a rectangular courtyard. There is a square tank in one corner of the courtyard, possibly used for raising fish - it would make sense to have it just outside the kitchen so that the cooks could easily get fresh fish. 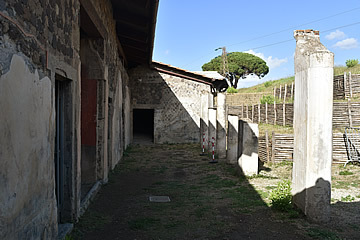 South of the rectangular courtyard is a praefurnium - a furnace room supplying the caldarium here with hot water. Part of a sauna has also been excavated. 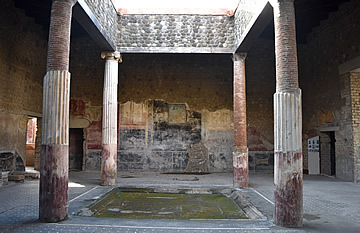 South-east of the baths area was a large square peristyle surrounded by more rooms including several bedrooms. The depiction of depth and perspective is very impressive, clearly a master artist was at work here. 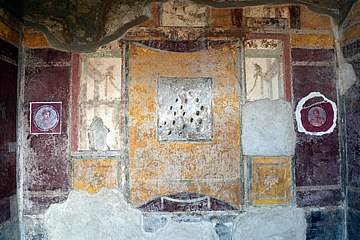 On the north west corner of the large peristyle, just on the edge of the baths complex, is a most beautifully decorated bedroom (Room 89). 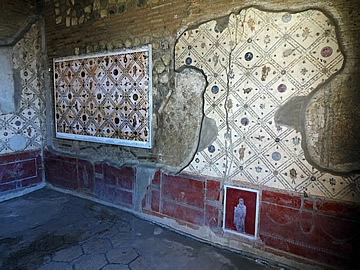 The floor is an almost intact mosaic in black and white - all the mosaic floors that we saw were black and white. The yellow painted walls are still vibrant with an unusual pink section surmounted by a sky blue pediment, and delicate painted figures adorn the panels of colour. 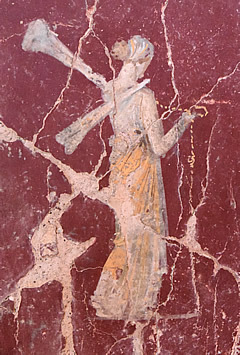 Venus, seller of cupids; Room 89. 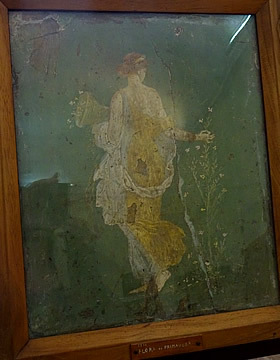 It may not look like much but it was extremely famous in the late 18th century, shortly after the villa was first excavated.6 The original is in the Naples Museum. 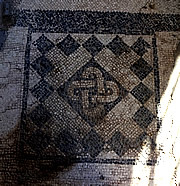 with detail of floor mosaic below. 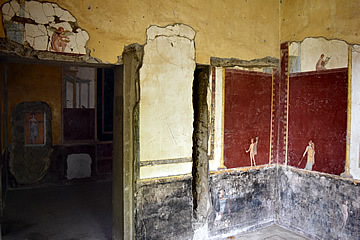 Just outside this exquisite bedroom, to the south, is a small columned space which the site leaflet describes as "ambiente colonnato" or "a colonnaded environment" (86). 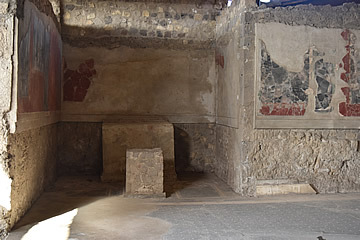 Several of the rooms around the square peristyle are described as "ambiente". 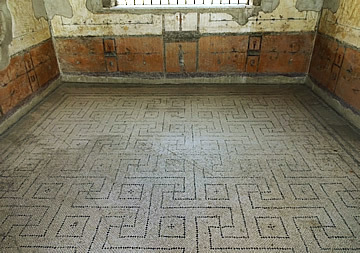 This one has the most beautiful mosaic floor, predominantly black. 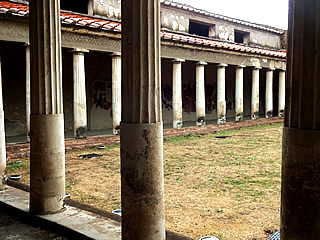 North portico of the square peristyle - the columns are of a very unusual oval cross-section. On the is the entrance to the atrium flanked by entrances to bedrooms 44 and 45. 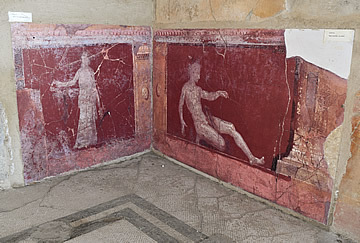 Room 84 - now Naples Archaeological Museum. On the west side of the square peristyle Bedroom 84 had two of the most famous frescoes, now in the Naples Archaeological Museum.8 The Room numbering in the museum is not the same as on the plan given at the site; in the museum the room numbers correspond to the numbering system of the site on a widely used plan of the villa credited to Valentin Kockel, though modified by others. So Room 84 on the site guide is W26 at the museum and on other published plans. 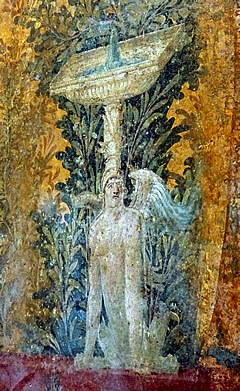 Leda and the Swan is easily identifiable. 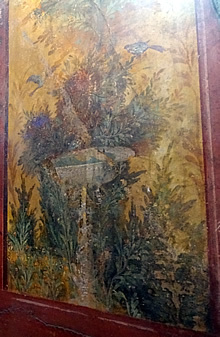 Flora is named for the female figure gathering flowers. Lararium for the worship of household deities, in the north east corner of the Tuscan atrium. 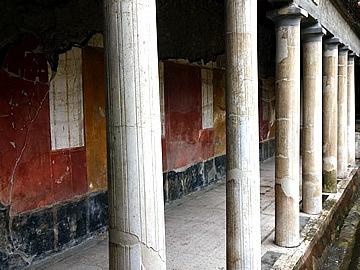 The rooms around the square peristyle date from the earliest period of the villa and are generally decorated in Second Style. None more obviously than in the bedrooms flanking the entrance to an atrium (Room 24) on the north side of the peristyle. The atrium is a Tuscan style - i.e. without columns supporting the roof. In its centre was an impluvium to catch the rainwater which drained into a cistern below. 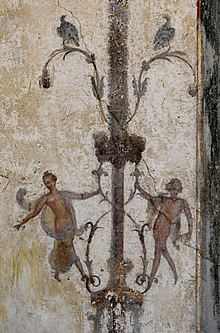 This is the oldest part of the villa, though the frescoes are in the Third Style. 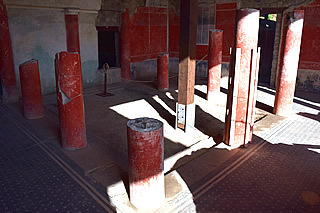 Tuscan Atrium with central impluvium. 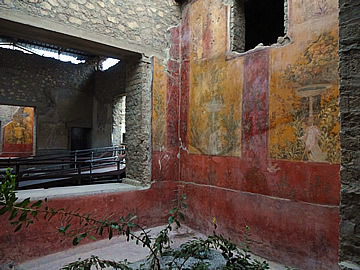 It's a great shame that much of the detail in the frescoes in the atrium is no longer discernable. 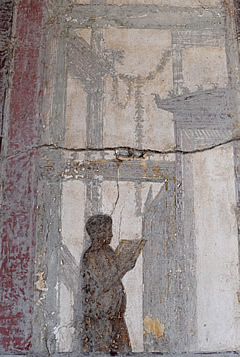 The borders to the frescoes are intricate but of the central panels only columns and vague architectural elements can be identified. According to the information board the central figures were detached in the nineteen fifties. 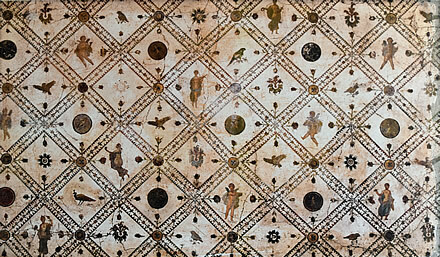 Decorative border on the frescoes adorning the walls of the Tuscan atrium. 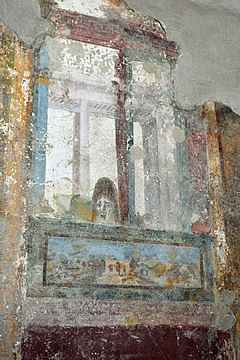 Entrance to a bedroom (45) on the north side of the square peristyle. 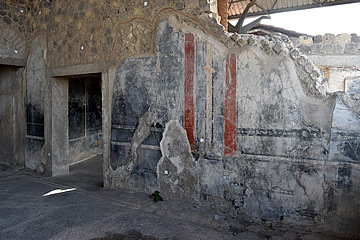 Of the two Second Style bedrooms (44 and 45) flanking the entrance to the atrium from the square peristyle, 45 on the east side is in the best-preserved state. In fact the wall decoration is almost complete. 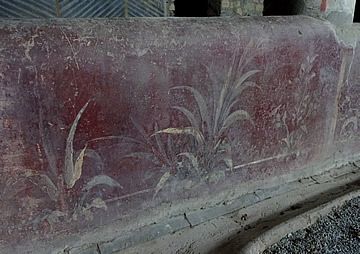 On the north side of the atrium the room decoration is not so well-preserved. 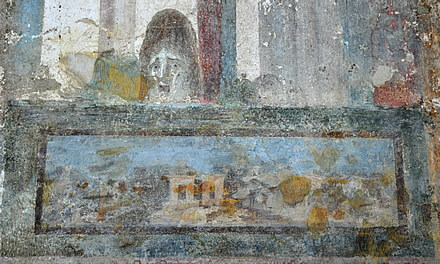 Room 42 would have had panoramic views over the Bay, for we are now back on the terraced hillside, and there is some lovely detail in the frescoes still visible. 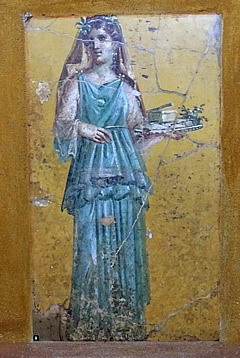 On the western side of the north entrance to the atrium Room 17 has some intriguing frescoes of figures. Detail Room 42, and below, sea horse and dolphin. Room 39 which lies on the west side of Room 34, between it and the atrium. 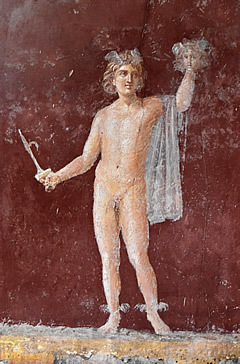 The originals of these female and male figures are in the Naples Museum. 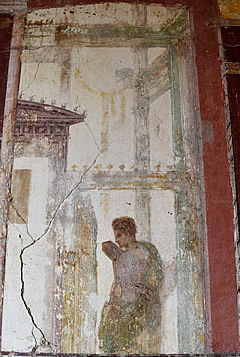 Beyond Room 34, across a narrow lane on the east side of the Villa Arianna, another three or four rooms away, lies a second villa, called the "Second Complex". Much smaller than Villa Arianna, perhaps 1,000 sq m, it nevertheless has an enviable position with panoramic views, though not quite as good as Villa Arianna as it faces slightly north east. 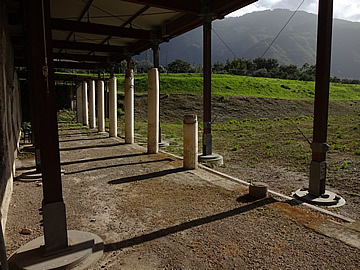 North edge of the peristyle, Second Complex. 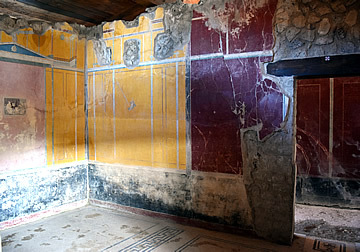 The rooms of this villa are arranged around a large rectangular peristyle, those on the north and north west sides enjoy the magnificent view and include a large triclinium and two oeci (substantial living rooms or halls), one (13) very large and twice the size of the other (14), as well as many day rooms. 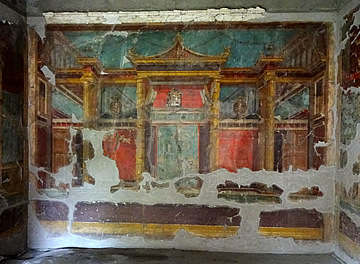 Three bedrooms have been excavated on the west side of the property, Room 15 has quite well-preserved frescoes. 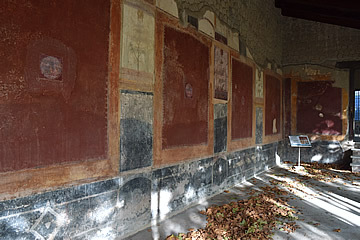 Many of the rooms are decorated in the Third Style on a black background. 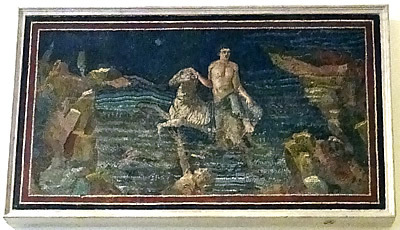 Detail, bedroom 15, sea horse and dolphin. 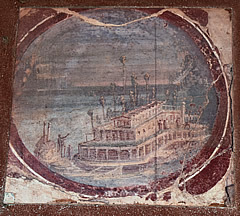 Room 13, the larger oecus, had views to the north over the Bay, and through windows in its east wall it overlooked the large peristyle. 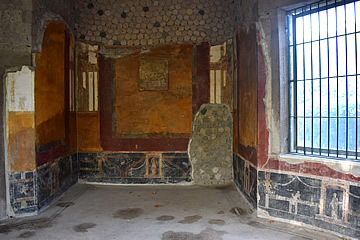 West wall of the smaller oecus, Room 14, with door leading into Bedroom 15. The two living rooms had a connecting door, and a door in the west wall of Room 14 led into bedroom 15. This was an altogether more modest establishment, though still way beyond the means of the vast majority of people. It has a disproportionately large peristyle, much bigger than the Villa Arianna's, though it must have been a lot cheaper to build a large peristyle than more rooms! 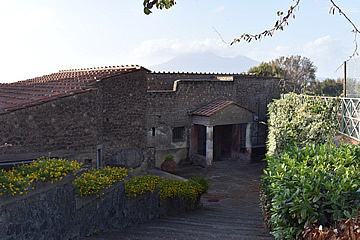 Entrance to Villa San Marco with Vesuvius behind. Roughly a km north east of Villa Arianna, still on the cliff top of the Varano Hill, Villa San Marco is one of the largest villas yet excavated in the region with an area of around 11,000 sq m. If anything it would have had even more splendid views over the Bay of Naples, being oriented more to face the west than Villa Arianna. The villa takes its name from a nearby chapel in the 18th century. Villa San Marco now lies 5m below current ground level - and awful lot of digging to make it accessible! 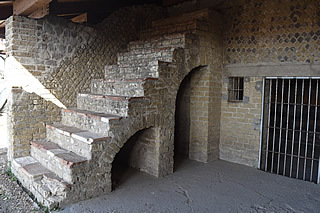 Atrium at the entrance to Villa San Marco (44). 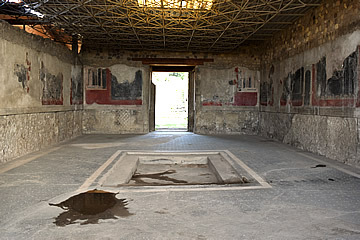 A large tetrastyle atrium with impluvium lies just within the entrance to the villa, dating from the time of Augustus, the latter half of the 1st century BC. 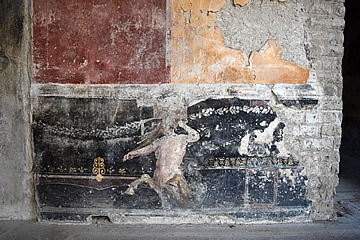 According to the information board the atrium is decorated in the Fourth Style, with lower walls decorated with centaurs and panther skins stretched between sticks, the middle ground with frescoes of mythological subjects. It's an imposing space and would have immediately impressed visitors with the owner's wealth and status. 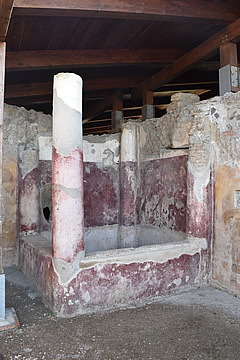 North east of the atrium is a baths complex, including an apodyterium - a changing room, a natatio - a cold plunge bath, frigidarium, tepidarium and calidarium. 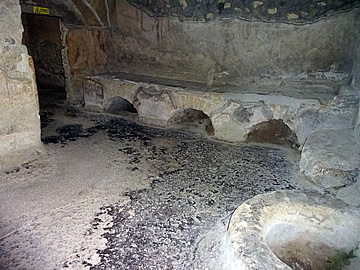 Bath in the caldarium, Room 29. 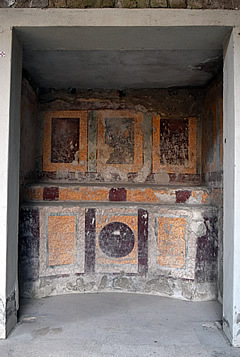 Apse in a tetrastyle atrium of the baths complex, Room 25. The curved window looked out onto a small viridario. For the worship of household gods. 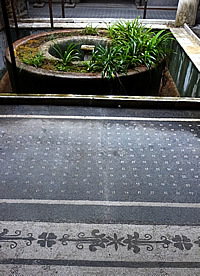 The baths complex has an unusual orientation with respect to the surrounding rooms but it follows the direction of the street below with which it communicates via an underground staircase. 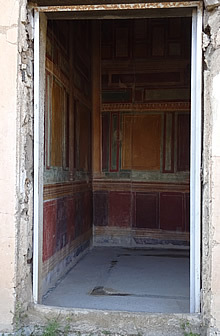 It has been postulated that the public were allowed to use the baths, especially as they could be isolated from the rest of the villa by a set of double doors. Still, it seems like a very unusual arrangement for an aristocrat. 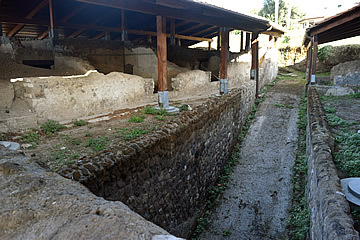 The baths complex also featured a small palestra or gymnasium. 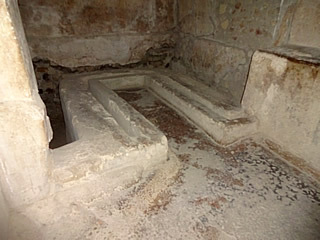 Room 52 on the west side of the atrium, a cubiculum. 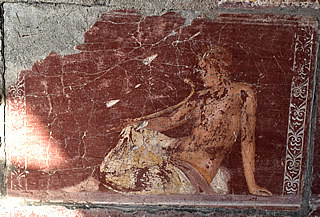 Several paintings are reproductions, the originals are now in the Naples Museum. 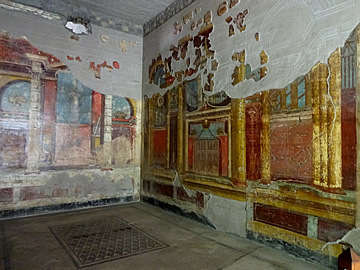 The atrium is surrounded by small rooms, on the west side was a lararium with painted decoration made to look like marble. Room 52 is another small room off the atrium on the west side, described as "cubiculo" (cubiculum) in the guide notes. Kitchen (26) west of the atrium. With a substantial cooking range on its north wall. Further west is a large kitchen with a number of service rooms around it - sleeping quarters for servants or store rooms. West again is one of the most beautiful parts of the villa, a long rectangular pool set within viridaria, with a peristyle on its east and west sides and also at the edges of the north side where the centre is occupied by the entrance to a large oecus (living room), fittingly right at the front of the villa, to enjoy the magnificent views. On the south side the pool widens into a curved arc of water above which stands the ninfeo or nympheum, a place dedicated to the spirits of water and springs. 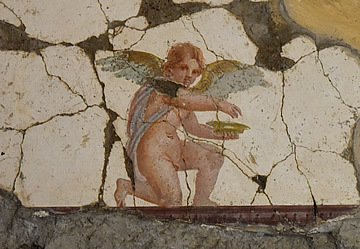 Originally in the nymphaeum, now the Naples Museum. Pool and viridaria looking south towards the nympheum. 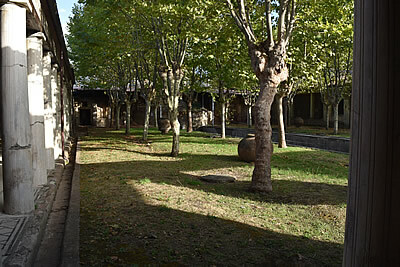 Today the viridaria are still planted with trees and on a warm, sunny late afternoon it is most peaceful spot. 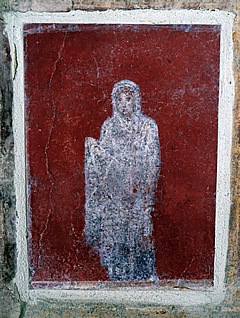 The east and west peristyles are beautifully decorated with some of the most exquisite small paintings, some are reproductions, the originals being in the Naples Museum. 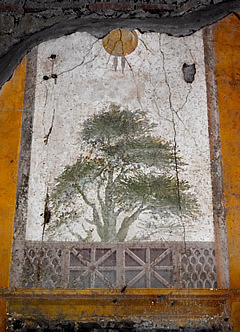 The larger frescoes depict plants and trees in keeping with the setting. The smaller medallions in the centre of the colour blocks depict maritime scenes including seaside villas. Pool, north end of the east peristyle. Pool, south end of the east peristyle. 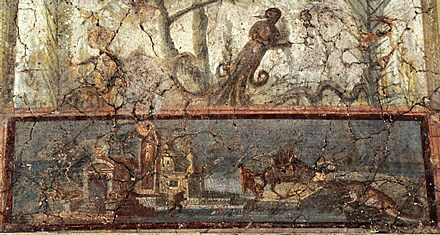 Maritime scenes in the east portico. Day room 30 and entrance to day room 50. 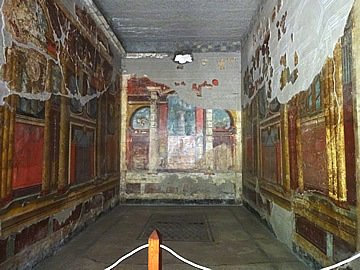 At the south end of the east portico is a set of two dieatae (day rooms, 30 and 50) and a triclinium (53) with some exquisite small painting. Many of the figures are very naturalistic and, unlike any other we have seen, are positioned to look as if they are standing or sitting on the frames of the colour blocks. 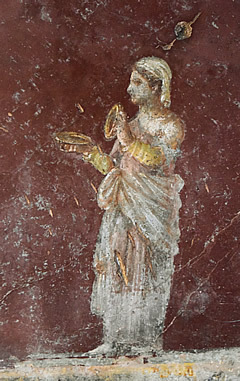 Iphigenia with the Palladium on her shoulder and holding a torch. Detail Room 30 above the entrance to Room 50. Room 50, doorway to Room 30 on the left. Room 50 looking south to the entrance to Room 53. 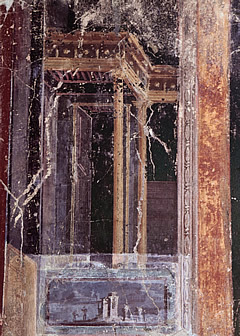 The trompe l'oeil effect is particularly well-shown here, with the end wall looking as if it has two windows overlooking a delicately columned portico. 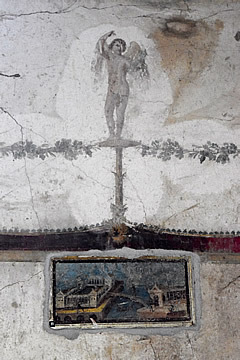 Room 53 was a triclinium according to the room information board, and has fine views over the pool and viridaria. 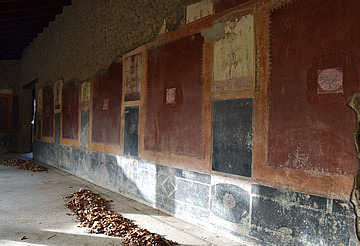 On the opposite side of the pool and viridaria on the south west corner is a similar set of three rooms, 8, 12 and 14, all diaetae, 8 and 12 with large windows looking onto the pool and gardens. The decoration in the west portico was mostly not so well preserved or restored. 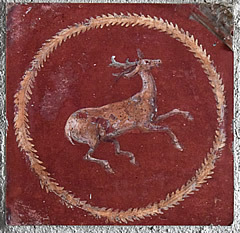 Stag detail Room 8 . 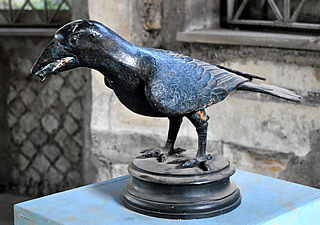 Copy of a bronze crow found at the villa and displayed in Room 12 along with copies of mosaics and a large marble vase (crater). It was probably a garden ornament used to feed water into a fountain. On the far west of the site is a huge rectangular peristyle which once surrounded another viridarium. It is perched right on the edge of the cliff and must have been a lovely shady place to walk and enjoy the magnificent views. 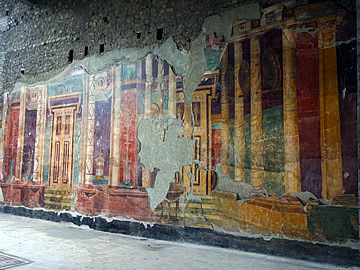 Pompeii, Robert Harris, Random House, 2003. 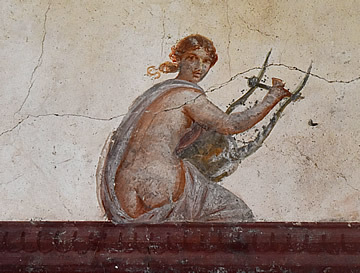 Pompeii: The History, Life and Art of the Buried City, Ed. Marisa Ranieri Panetta, White Star Publishers, 2004. Nissin, Laura. (2009). 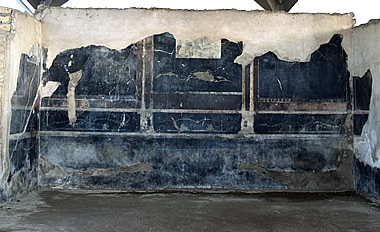 Cubicula diurna, nocturna - revisiting Roman cubicula and sleeping arrangements. Arctos. 43. The Rough Guide to Rome and the Michelin guide to Rome were used. 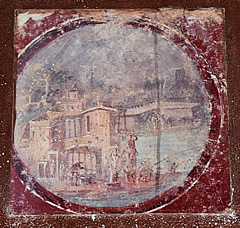 Thanks also to www.pompeiiinpictures.com which helped me to locate some photographs within the villas.